Tartt (shoulder) was placed on injured reserve Monday. Analysis: Tartt missed the previous three games with the shoulder issue that has bothered him for a good chunk of the season. The 26-year-old finishes 2018 with 42 tackles (32 solo) and one interception in eight games. Marcell Harris and D.J. Reed should continue to work as the 49ers' starting safety tandem in Sunday's season finale against the Rams. Tartt (shoulder) avoided Wednesday's injury report, Nick Wagoner of ESPN.com reports. Analysis: Tartt has seemingly recovered from the shoulder injury that had plagued him for much of the season. 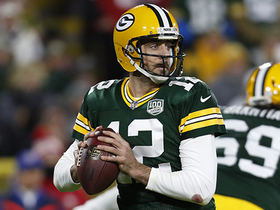 It's unclear as to whether he'll suit up in the team's regular-season finale come Sunday. At the very least, it's good to see Tartt back at full strength once again. Tartt (shoulder) was placed on injured reserve Friday, Matt Maiocco of NBC Sports Bay Area reports. Analysis: Tartt missed the last two games after aggravating his shoulder injury, and he now lands on season-ending injured reserve. In Tartt's absence, expect D.J. Reed and Antone Exum to both continue enjoying increased defensive roles. 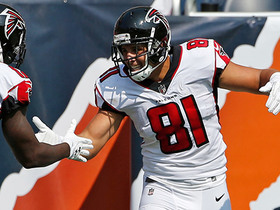 Tartt (shoulder) was ruled out for Sunday's game against the Bears, Nick Wagoner of ESPN.com reports. Analysis: Tartt will miss his third straight game since aggravating the shoulder injury Week 13 against the Seahawks. D.J. Reed and Antone Exum should both continue to see significant defensive snaps in his absence. Tartt (shoulder) is ruled out for Sunday's game versus the Seahawks, Eric Branch of the San Francisco Chronicle reports. Analysis: Tartt hurt his shoulder in Week 13's game against the Seahawks and hasn't been able to shake the issue since. His absence will allow D.J. Reed and Antone Exum to rotate in at free safety against a Seahawks pass attack that thrives on the deep ball. Tartt (shoulder) has been ruled out for Week 14 against the Broncos, Cam Inman of the Bay Area News Group reports. Analysis: Tartt has been dealing with a shoulder issue for a solid chunk of the season and aggravated the injury in Week 12 against the Seahawks. With the 49ers well out of playoff contention, the team has no reason to rush Tartt back to action before his injured shoulder is fully recovered. 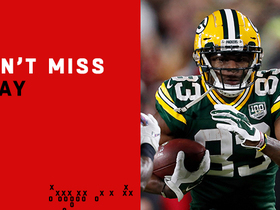 In the meantime, Antone Exum figures to fill in as San Francisco's starting strong safety. Tartt (shoulder) is questionable to return to Sunday's game against the Seahawks, Matt Maiocco of NBC Sports Bay Area reports. Analysis: Tartt aggravated a shoulder injury he sustained during a Week 12 loss to the Buccaneers, and it remains to be seen whether he'll be able to return to Sunday's divisional tilt against the Seahawks. Antone Exum will draw the start at strong safety as long as Tartt remains sidelined. Tartt (shoulder) does not have an injury designation for Sunday's game against the Seahawks. Analysis: Tartt was a limited participant in practice all week, but he's apparently shown enough progress in his recovery to suit up for Sunday's divisional tilt against Seattle. He'll draw the start at strong safety and attempt to contain the Russell Wilson-led air attack in Week 13. Tartt exited Sunday's game after suffering a shoulder stinger, Eric Branch of The San Francisco Chronicle reports. Analysis: Tartt missed the two games prior to Sunday's tilt due to a shoulder injury. and it's unclear if this is an aggravation of the same. He should be considered questionable for the time being, with his practice status later in the week providing a clearer picture of his ability play in Week 13 against the Seahawks. Tartt (shoulder) is practicing Monday and looks "ready to return," Cam Inman of The San Jose Mercury News reports. Analysis: Tartt has missed two consecutive games due to a lingering shoulder injury, but he appears to have made real progress in his recovery during the 49ers' bye. The release of Wednesday's first practice report of the week should shed some light on Tartt's chances of retaking the field against the Buccaneers on Sunday. Tartt (shoulder) will not play in Monday's game against the Giants, the 49ers' official site confirms. Analysis: Antone Exum cleared concussion protocol just in time as the fourth-year safety will fill in with Tartt inactive. Exum started two games this season, earning 12 tackles over those two back-to-back contests. Tartt (shoulder) sat out Saturday's practice, Matt Barrows of The Athletic reports. Analysis: Tartt's inability to practice suggests there's a good possibility he'll miss Monday's contest. He'll likely go through pregame warmups before a decision is reached, but things don't appear to be trending in the right direction. Antone Exum could witness an increased workload if Tartt is ruled out. Coach Kyle Shanahan called Tartt (shoulder) "questionable" for Monday's game against the Giants, Eric Branch of the San Francisco Chronicle reports. Analysis: Tartt did not practice Thursday due to a shoulder injury he suffered during a Week 8 matchup against the Cardinals. If Tartt is unable to go again Week 10, expect Tyvis Powell to start at strong safety. Tartt (shoulder) is ruled out for Thursday's game against the Raiders. Analysis: Tartt suffered a shoulder injury during Sunday's loss to the Cardinals and will remain sidelined as he works to recover. With Antone Exum (concussion) also ruled out, the 49ers could move Tyvis Powell to strong safety during Thursday Night Football. Tartt (shoulder) sat out Tuesday's walkthrough, Nick Wagoner of ESPN.com reports. Analysis: Tartt injured his shoulder during Sunday's contest against the Cardinals and failed to return to action. Tartt will likely need to practice Wednesday in order for him to play Thursday against the Raiders. Tartt is ruled out for Sunday's game against the Cardinals due to a shoulder injury, Eric Branch of the San Francisco Chronicle reports. Analysis: As long as Tartt remains sidelined, Antone Exum will serve as the 49ers' top strong safety. Tartt should be considered questionable for Thursday's game against the Raiders until more information about his injury is disclosed. Tartt wrapped up nine tackles (seven solo) in Monday's 33-30 loss to the Packers. 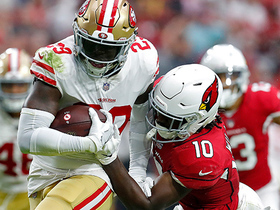 Analysis: Tartt made a healthy return from a shoulder injury last week against the Cardinals, recording three tackles in a game that didn't see a 49ers defender get more than four. Monday's nine-tackle performance is a better indicator of the upside the safety possesses in IDP formats. Assuming he can stay off the injury list, Tartt is a good bet to lead all San Francisco defensive backs in tackles this season. Tartt (shoulder) took part in Wednesday's practice in a full capacity, Cam Inman of The San Jose Mercury News reports. Analysis: It was suggested Monday that Tartt would return to practice this week, and a full practice session Wednesday puts him in position to rejoin the lineup Sunday against the Cardinals after missing the last two weeks. Tartt (shoulder) is expected to return to practice this week, Matt Maiocco of NBC Sports Bay Area reports. Analysis: Tartt has been sidelined since re-injuring his shoulder in mid-September. If he can return this week, the veteran will likely be used in a variety of roles within the San Fran secondary given his defensive versatility. 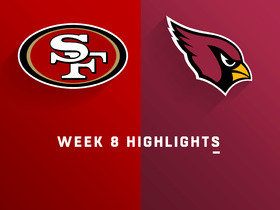 Tartt (shoulder) is inactive for Sunday's game against the Chargers, Nick Wagoner of ESPN.com reports. Analysis: Tartt will miss his second regular season game in a row due to a shoulder injury. Expect Antone Exum to step into the 49ers' starting lineup and continue to serve as the team's starting strong safety as long as Tartt remains sidelined. Tartt (shoulder) is listed as doubtful for Sunday's game against the Chargers, Cam Inman of The San Jose Mercury News reports. Analysis: Tartt will miss his second consecutive regular-season game due to a shoulder injury sustained in Week 2's game against the Lions. As long as the fourth-year safety remains sidelined, Antone Exum is likely replace Tartt as a starter. Tartt (shoulder) did not practice Wednesday and is unlikely to play Sunday against the Chargers, Matt Barrows of The Athletic reports. Analysis: Tartt originally sustained a shoulder injury in Week 2 against the Lions and was inactive for last Sunday's game against the Chiefs. San Francisco doesn't think Tartt's injury is long term, but his absence from practice suggests he's trending in the wrong direction for Week 4. If Tartt misses his second consecutive game, it will be Antone Exum and Tyvis Powell taking snaps at the safety position. Tartt (shoulder) is inactive for Sunday's tilt against Kansas City. Analysis: Tartt played through his shoulder injury in Week 2 but the issue got worse during the game. His limited participation in Friday's practice made the team hopeful he'd be able to play Sunday. Now that he's been ruled out, look for Antone Exum to get the spot start at safety. The 49ers have listed Tartt (shoulder) as questionable for Sunday's contest against the Chiefs. Analysis: Tartt was unable to practice earlier in the week, but returned in limited fashion at Friday's session. He has recorded 11 tackles (eight solo) and one pass defended through two games this season. His status for Week 3 seems up in the air, so Antone Exum would presumably fill in at starting strong safety should Tartt ultimately not suit up. Tartt (shoulder) did not practice Thursday. Analysis: Tartt has not yet practiced leading up to Sunday's tilt against the Chiefs. The starting strong safety continues to nurse a shoulder stinger, and he should be considered questionable for Week 3. Antone Exum would get the start at strong safety if Tartt were sidelined for any amount of time. According to head coach Kyle Shanahan, Tartt is considered day-to-day with a shoulder stinger, Matt Barrows of The Athletic reports. Analysis: Tartt was dealing with the same injury last week, but he seemingly aggravated it in Sunday's game against the Lions. If he is unable to go in Week 3, look for Antone Exum to get the start at strong safety. Tartt left Sunday's contest in the fourth quarter with an apparent shoulder injury, Matt Barrows of The Athletic reports. Analysis: Tartt was cleared for action after nursing a shoulder injury during practice this week, but it appears that his exit is related to the same issue. The 26-year-old safety recorded five tackles (three solo) prior to exiting. Antone Exum would presumably start at strong safety next week if Tartt is unable to suit up against the Chiefs. 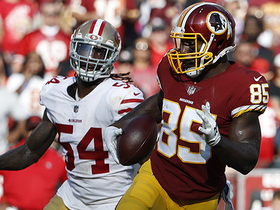 Tartt (shoulder) is absent from the 49ers' injury report ahead of Sunday's game against the Lions. Analysis: Tartt practiced in limited fashion all week, but it looks like the team was just exercising caution with their starting strong safety. Barring any setbacks, he is ready to go for Week 2. Tartt (shoulder) was a limited participant in Thursday's practice, Nick Wagoner of ESPN.com reports. Analysis: The 49ers' starting strong safety, Tartt seems to be battling through a shoulder injury of undisclosed severity. It remains to be seen whether Tartt will suit up against the Lions on Sunday, but if the 25-year-old misses any time, expect Antone Exum to play in his stead. Tartt (forearm) started Thursday's preseason opener, recording two tackles in a win over Dallas. Analysis: Tartt had his 2017 season cut short by a forearm fracture, but his presence in the starting lineup indicates good health heading towards the regular season. The 25-year-old is lined up to start at strong safety after recording 55 tackles and an interception in nine games last season. Tartt (forearm) signed a two-year contract extension Friday, Matt Maiocco of NBC Sports Bay Area reports. Analysis: Tartt is now under contract through the 2020 season. The 2015 second-rounder emerged as the starting strong safety last year and currently seems to be the favorite to open the 2018 season in the same role. While it isn't clear where he stands in his recovery from a fractured forearm, there doesn't seem to be any concern over Tartt's availability for training camp this summer. 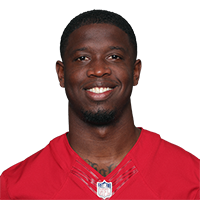 San Francisco head coach Kyle Shanahan said Tartt will be placed on injured reserve this week after fracturing his forearm in Sunday's loss to Arizona, Matt Barrows of The Sacramento Bee reports. Analysis: The 49ers will be without their starting safety tandem for the rest of the season after Jimmie Ward broke his forearm a week earlier in San Francisco's loss to the Eagles. Tartt, a 2015 second-round pick, who had been in the midst of a breakout season with 55 tackles and an interception in just nine games, should have a strong case for a starting role in 2018 if he makes a full recovery from surgery, as is expected. Tartt broke his wrist in Sunday's game against the Cardinals and is expected to land on IR, Eric Branch of the San Francisco Chronicle reports. Analysis: It's devastating news for the third-year veteran, who had filled in for and subsequently wrested the starting job from Eric Reid. With Tartt's season over, Reid ought to return to his starting role once again. Tartt (wrist) was ruled out for the remainder of Sunday's game against the Cardinals, Cam Inman of The San Jose Mercury News reports. Analysis: Tartt was initially designated questionable to return after suffering the injury in the first half. Eric Reid is the most likely candidate to step in at strong safety. Tartt is questionable to return to Sunday's game against the Cardinals due to a wrist injury. Analysis: Tartt was forced to exit the game in the first half. If he is held out for the remainder of the contest, Eric Reid and Dexter McCoil could be in line for increased roles. Green Bay Packers wide receiver Marquez Valdes-Scantling somehow turns around for circus catch from quarterback Aaron Rodgers. 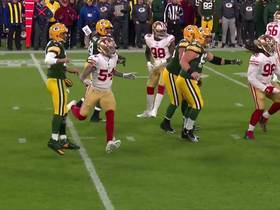 Green Bay Packers quarterback Aaron Rodgers perfectly threads needle between the San Francisco 49ers defenders to find tight end Jimmy Graham. Green Bay Packers quarterback pump fakes a few times before finding tight end Jimmy Graham for 11 yards. 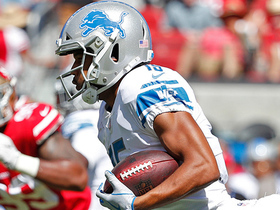 Detroit Lions wide receiver Golden Tate makes defenders miss on this 67-yard gain. Washington Redskins tight end Vernon Davis makes a huge play down field, taking it 52 yards on the reception from QB Kirk Cousins. 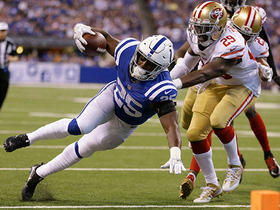 Indianapolis Colts running back Marlon Mack with a big run down the sidelines that is originally called a touchdown, but later reversed. 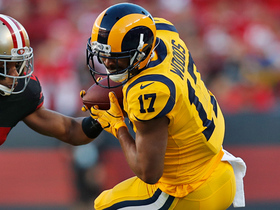 Los Angeles Rams wide receiver Robert Woods evades defenders and shows his acceleration on a 25-yard catch-and-run. The top plays of Week 1 from the 2017 season.